A trio of reports have surfaced over the weekend about the iPhone 5, all of which shed light on the components that will be tightly packed inside its demure frame. A Chinese web forum has published images of what's believed to be the sixth-gen iPhone motherboard, and while it doesn't reveal what processor will power Apple's next handset, it's definitely different than iPhones currently on the market. 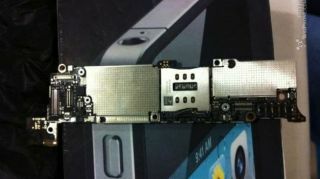 The battery connector now contains five pins instead of the four used on the iPhone 4S, while the digitizer connection received an upgrade as well. Additional antenna connections also provide further confirmation that the next handset will come with 4G LTE, although there is some confusion as to whether or not the next iPhone will adopt the new nano-SIM standard as previously reported. To help put all of these random parts in context, iPhone repair specialist iFixYouri posted a diagram showing how the various part leaks interconnect, using the latest motherboard leak as a guide. The mere fact that all of these various parts appear to fit together is a good sign that they're legitimate, particular with a rumored Apple media event being held September 12 where the handset is widely expected to make its debut. Finally, industrial designer Don Lehman weighed in on the current iPhone 5 prototypes, noting that the unibody wraparound metal backplate appears to make sense when viewed against the progression of Apple's antenna technology. Lehman noted the unibody design currently making the rounds is likely to be "stronger, lighter and thinner" in keeping with the Cupertino company's MacBook designs. Ditching a full glass back on the next iPhone actually reduces the size by two or three millimeters. "That sounds small, but it's a huge difference," Lehman said. "That's as much as 32 percent thinner. As a point of comparison, the Retina MacBook Pro is only 25 percent thinner than the old MacBook Pro."